PARTNERSHIP: Maryville music therapy graduate student Stephanie McAllister Holly works with a Confluence Academy-Old north student to compose a song related to his life experience. 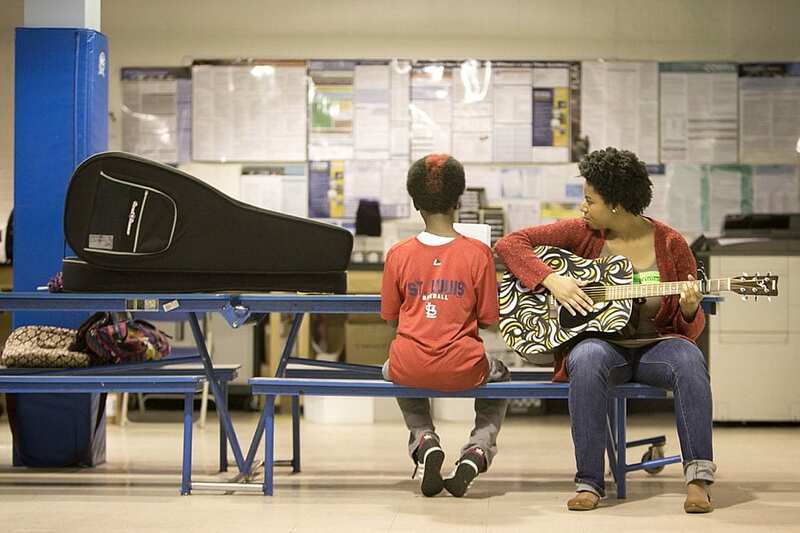 Working at Confluence Academy-Old North, a charter school located in St. Louis, music therapy students help middle schoolers pour their feelings into instrumentals and lyrics through a program called Life Songs. Songwriting is a path to broader accomplishments, like increased self-esteem and reduced anxiety. Confluence students who have composed and recorded original singles through the project live in families of low socio-economic status. In this environment of insufficient resources, students have experienced significant stressors, including having a parent in jail and losing a loved one to gun violence. One young man whose father was killed by a bullet composed a song titled “Never Backing Down,” which draws a straight line from his life to what happened on Aug. 9, 2014, in Ferguson. Maryville graduate student Stephanie McAllister Holly says the personal situations of students are often difficult for them to navigate. Holly is the first graduate assistant for the Life Songs program, a position funded by Sterling Bank. She identifies with some of the students’ stories. Holly grew up in a single-parent home with her mother, who worked two jobs to make ends meet. Though they faced many challenges, Holly found an outlet through music and through the loving support of family. Working with the students one-on-one, Holly begins by asking what kind of music they like. She pulls up a song on her computer and they listen together, and talk about how it relates to the young person’s life. “Then, I’ll ask, ‘Hey, is this something you want to write about or sing about?’” Holly says. In her graduate assistant position, Holly supervises Maryville students like senior Kristin Moulder, who works directly with Confluence kids. Moulder’s first student was initially reluctant to open up. But after Moulder told the young girl that she, too, suffers from shyness, the middle-schooler began to share. Like Holly, Moulder starts a session by listening to music and discussing it before any actual music is created. Using the software GarageBand, students create sound through virtual and real guitars, keyboards and other instruments. They can record their own instrumentals and lyrics, and apply special effects. Moulder’s first student produced a song that urges listeners to never give up. “Our kids are coming in early on the days they have it,” Murray says. The students are eager for people to hear their songs, and often perform at assemblies. The school sells their CDs as a fundraising activity. The music therapy partnership is a “win-win for everybody,” Murray says. The middle-schoolers also record their creations at Shock City Studios, which donates its services. The first group held a concert at the Sun Theater in Grand Center. Even though the number of kids who participate directly is limited, singer Owens says their music gives many more a new way to look at the world. “When other students listen to these songs and take them in, it can be an alternative to the less-than-positive messages they get elsewhere in their lives,” Owens says.